Blackhawk Commando Chest Harness FREE SHIPPING! BlackHawk's version of The Classic Rhodesian Rig. Also holds less lethal munitions. 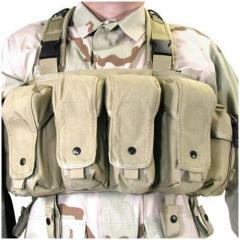 Each of the four pockets holds up to three AK-47, M-16, or two M-1 magazines. Each pouch has a divider to prevent magazine noise and slapping when quiet movement is imperative. The two end utility pouches can hold other items such as: radios, rations, compasses, etc. The inside back portion is padded with .25 inch closed cell foam for extreme comfort and added flotation when crossing rivers or streams. The inside back portion also has a larger utility or map pouch with a Durasnap securing flap. Has adjustable padded criss-cross shoulder straps with .5 inch side release buckle. Wt: 2 lbs 2 oz. ©2002-2019 CopsPlus.com: Blackhawk Commando Chest Harness FREE SHIPPING!